Israeli forces killed a Palestinian child in al-Jalazone refugee camp and a woman in occupied Jerusalem. 9 Palestinian civilians, including 2 children, were wounded. Israeli forces conducted 51 incursions into Palestinian communities in the West Bank. 57 civilians, including 14 children and 3 young women, were arrested in the West Bank. 25 of them, including 8 children and two young women, were arrested in occupied Jerusalem and its suburbs. Among those arrested were 10 of al-Aqsa guards. Israeli forces forced a civilian to self-demolish his house roof in Beit Hanina, north of the city. Two under-construction houses in al-Issawiyah were demolished in addition to two inhabited ones in al-Mukaber Mount, rendering 14 persons homeless, including 10 children. A mobile house (caravan) was confiscated from the Northern Jordan Valley, and a metal workshop was demolished in al-Jaftalak village, north of Jericho. 7 Palestinian civilians, including a child, were arrested at military checkpoints in the West Bank. Israeli violations of international law and international humanitarian law in the oPt continued during the reporting period (23-29 March 2017). During the reporting period, Israeli forces killed a Palestinian child and woman. Meanwhile, they wounded 9 other civilians, including 2 children, in the West Bank. In the Gaza Strip, Israeli forces continued to chase Palestinian fishermen in the sea and open fire at the farmers in the border areas. In the West Bank, in a new crime of using excessive force, on 23 March 2017, Israeli forces killed a Palestinian civilian and wounded 4 others, including 2 children. All of them were from al-Jalazone refugee camp, north of Ramallah. Israeli forces claimed that Palestinians in a car traveling near Beit Eil Settlement threw Molotov Cocktails at the settlement fence. The Israeli soldiers fortified in a watchtower opened fire at a car. As a result, a child was killed and 4 other civilians were wounded. According to information available at PCHR, if the Israeli forces’ claims were true, they could have used less lethal forces against the abovementioned civilians and arrested them. In a new crime of wilful killings, on 29 March 2017, Israeli forces killed a Palestinian civilian identified as Siham Rateb Nemer (49) after opening fire at her when she was entering the Damascus Gate (Bab al-‘Amoud) in occupied Jerusalem. Israeli forces claimed as usual that the abovementioned woman attempted to stab an Israeli soldier. However, PCHR’s investigations refuted those claims. It should be mentioned that Siham is the mother of Mustafa Nemer, who was shot dead by Israeli soldiers on 05 September 2016 when he was driving a car along with his relative on ‘Anata Street in Sho’afat refugee camp, northeast of occupied Jerusalem. As a result, he was killed and his relative was wounded. On 24 March 2017, 5 Palestinian civilians were wounded while participating in a demonstration in al-Qaboun area near al-Mugheir village, northeast of Ramallah. This demonstration was in protest against the establishment of a sheep barn by a settler in an attempt to establish a settlement outpost on the Palestinian lands. In the Gaza Strip, as part of targeting the border areas, on 25 March 2017, Israeli forces stationed along the border fence between Israel and the Gaza Strip opened fire at the agricultural lands, east of Beit Lahia in the northern Gaza Strip. No casualties were reported. On 28 March 2017, Israeli forces stationed inside watchtowers along the eastern borders of Beit Hanoun in the northern Gaza Strip opened fire at the border area opposite to al-Ahmar area. No casualties were reported. In the context of targeting Palestinian fishermen, on 25 March 2017, Israeli gunboats stationed northwest of Beit Lahia in the northern Gaza Strip opened fire at the Palestinian fishing boat sailing there. However, no casualties were reported. The shooting recurred in the same area on 29 March 2017. During the reporting period, Israeli forces conducted at least 51 military incursions into Palestinian communities in the West Bank. During these incursions, Israeli forces arrested at least 57 Palestinian civilians, including 14 children and 3 young women. Twenty-five of them, including 8 children and 2 young sisters, were arrested in occupied Jerusalem. Among those arrested were 10 of al-Aqsa guards. In the context of house demolitions, on 25 March 2017, Yousif Bakhtan self-demolished a house roof in al-Ashqariyah neighborhood in Beit Hanina neighborhood, north of occupied Jerusalem, to avoid the Israeli Municipality’s high demolition costs . On 28 March 2017, Israeli forces demolished an under-construction house belonging to Ahmed Abu al-Homos and an under-construction building belonging to Mheisen family in al-Issawiyah village, northeast of occupied Jerusalem. On 29 March 2017, Israeli forces demolished two houses belonging to Islam and Imam Mousa al-‘Abasi in al-Mukaber Mount villagem, southeast of occupied Jerusalem. The two houses were built in 2014 on an area of 160 square meters. the first house sheltered Islam al-‘Abasi and his 8-member family, including 6 children, while the second houses sheltered his brother Imam and his family comprised of 6 members, including 4 children. On 27 March 2017, Israeli forces demolished a barrack used as a metal workshop in al-Jaftalak village, north of Jericho. The 144-square-meter barrack roofed and built of tin plates belongs to Anwar Abu Joudah, whose family is comprised of 10 members, including 8 children, and he is the sole breadwinner of his family. On 28 March 2017, Israeli forces confiscated a mobile house (caravan) in al-Hammah area in the Northern Jordan Valley, east of tubas. The caravan belongs to Mahmoud ‘Awwad Ayoub and donated from ACTED Foundation. At approximately 01:00, Israeli forces moved into Deir Netham village, northwest of Ramallah, and patrolled in the village streets. They arrested Ragheb Mohammed Abdul Rahman (14) and released him few hours later. At approximately 01:30, Israeli forces moved into Nablus, and stationed in al-Ma’ajin area, west of the city. They raided and searched a house belonging to Baraa’ Mohammed Abu al-Nawas (24) and then arrested him. At approximately 02:00, Israeli forces moved into ‘Atil village, north of Tulkarm. They raided and searched a number of houses, after which they arrested Mothanna Abdullah Mohammed Sadlah (26). At approximately 16:00, Israeli forces moved into Kufur al-Deek village, west of Salfit, and patrolled in the streets. They then arrested 3 children namely Mahmoud Ghassan Fasoul (17), Anas Abdul Jabbar Hadrous (17) and Mo’taz Ahmed Isam’il al-Deek (14). At approximately 18:00, the Israeli forces released them. In a new crime of excessive use of lethal force, Israeli forces killed a Palestinian child and wounded 4 others, including 2 children. All of them are from al-Jalazoun refugee camp, north of Ramallah. According to PCHR’s investigations, at approximately 20:00 on the same day, the Israeli soldiers stationed in the military watchtowers established at the western outskirts of “Beit Eil” settlement, north of Ramallah, adjacent to al-Jalazoun refugee camp from the eastern side, opened fire at a civilian car traveled by 5 civilians, including 3 children from the abovementioned camp. As a result, Mohammed Mahmoud Ibrahim Hattab (17) was hit with 2 live bullets to the chest and shoulder and died after short time. Four other civilians, including 2 children, were hit with live bullets, seriously wounding 3 of them. The first of those wounded was an 18-year-old civilian who sustained 2 live bullet wounds to the chest and abdomen, while the second is an 18-year-old civilian who was hit with 2 live bullets to the head and right thigh. The third was a 15-year-old civilian who sustained a live bullet wound to the chest. Their wounds were classified as serious. Moreover, a 17-year civilian sustained shrapnel wounds to the head. The Israeli forces claimed that while those Palestinian civilians were driving a private car near “Beit Eil” settlement, they threw Molotov Cocktails at the settlement fence. The soldiers, who were in the watchtower, opened fire at the car. As a result, Hattab was killed and four others were wounded. PCHR’s fieldworker could not find a local eyewitness to approve or deny the Israeli claims due to the closure of the shops near the area. According to information available at PCHR and even if the Israeli claims were true, the Israeli forces could have used less lethal force against those civilians and arrested them. (PCHR keeps the names of the wounded civilians). Note: During the aforementioned day, Israeli forces conducted (4) incursions in the following areas and no arrests were reported: Beit Wazan village, west of Nablus; Sa’ir, Taffouh and Karmah villages in Hebron. At approximately 01:30, Israeli forces moved into the southern area in Hebron. They raided and searched 2 houses belonging to Osama Nayef ‘Abbas Abu Suneinah (20) and Hazem Eshaq Abdul Fattah Wahdan (21) and then arrested them. At approximately 17:30, Israeli forces moved into Silwad village, northeast of Ramallah. They raided and searched a house belonging to Ahmed Fathi Qadri (33) and then arrested him. At approximately 20:20, Israeli forces moved into ‘Ourta village, southeast of Nablus. They raided and searched a house belonging to Thaer ‘Arabi ‘Awad (28) and then arrested him. Note: During the aforementioned day, Israeli forces conducted (3) incursions in the following areas and no arrests were reported: Beit Furiq village, east of Nablus; Surif and Beit Awa villages in Hebron. At approximately 07:00, Israeli gunboats stationed offshore, northwest of Beit Lahia in the northern Gaza Strip, opened fire at Palestinian fishing boats sailing within 3 nautical miles and chased them. The shooting sporadically recurred until at approximately 10:00. As a result, the fishermen were forced to flee for fear of their lives, but neither casualties nor material damages were reported. Note: During the aforementioned day, Israeli forces conducted (4) incursions in the following areas and no arrests were reported: Hebron, Halhoul, Beit Awla villages and al-‘Aroub refugee camp in Hebron. At approximately 01:00, Israeli forces moved into Taffouh village, west of Hebron. The soldiers surrounded al-Reda Building while a number of them raided and searched a house belonging to Ref’at Sarhan Tarwah and then arrested him. They confiscated a drone with camera. At approximately 02:00, Israeli forces moved into al-Jalamah village, northeast of Jenin. They raided and searched a number of houses and then arrested 3 civilians namely Rami Hesham Nader Abu Farhah (21), Manaf Ahmed Abdullah Abu Farhah (21) and Tareq Khalil Sha’ban (32). At approximately 03:00, Israeli forces moved into Zeta village, south of Tulkarm. They raided and searched a number of houses and then arrested Ayham Roumal ‘Ali Abu Hamdi (17). At approximately 11:00, Israeli forces stationed in military watchtowers along the eastern side of the al-Shuhada Cemetery, east of Jabalia in the northern Gaza Strip, opened fire at agricultural lands adjacent to the border area. As a result, the farmers were forced to leave the area for fear of their lives, but neither casualties nor material damages were reported. Note: During the aforementioned day, Israeli forces conducted (3) incursions in the following areas and no arrests were reported: Yasouf village, east of Salfit; Emrish and Surif villages in Hebron. At approximately 01:30, Israeli forces moved into Sa’ir village, east of Hebron, and patrolled in the streets. A number of young men threw stones at the Israeli jeeps. An Israeli soldier then stepped out of a jeep and randomly opened fire at the young men, but no casualties were reported. Following that, about 30 military jeeps arrived at the centre of the village as the soldiers deployed in the area. Later, the Israeli forces withdrew, but neither arrests nor raids were reported. Around the same time, Israeli forces moved into Rantees village, northwest of Ramallah. They raided and searched houses belonging to Jehad Sari Wahdan (30), Mo’taz Samih Wahdan (30) and Zaid Samhan Wahdan (24) and then arrested them. At approximately 02:00, Israeli forces moved into Nour Shams refugee camp, east of Tulkarm. They raided and searched a number of houses and then arrested ‘Alaa’ Khaled Mahmoud Ismail (23) and Emad Ahmed Yusuf Abu Harb (34). Around the same time, Israeli forces moved into Tulkarm. They raided and searched several houses then arrested Ra’fat Jamil Mohammed Basif (50) and Hamzah Yahiya (24). It should be noted that Nasif is a Hamas leader in Tulkarm. At approximately 03:00, Israeli forces moved into Abu Romman neighbourhood in the south-eastern area in Hebron and stationed near al-Tamimi family Divan. They raided and searched a house belonging to ‘Adnan Fanoun al-Tamimi and then handed his son Ahmed (22) a summons to refer to the Israeli Intelligence “Shin Bet” in “Gush Etzion” settlement complex, south of Bethlehem. Note: During the aforementioned day, Israeli forces conducted (5) incursions in the following areas and no arrests were reported: Qalqiliyah, Yatta, Bani Na’im, al-Shoyoukh villages and Farsh al-Hawa area in Hebron. At approximately 01:30, Israeli forces moved into Tal village, southwest of Nablus. They raided and searched a number of houses, after which they arrested Sojoud ‘As’ad Rihan (25), an engineering student in Najah National University. Around the same time, Israeli forces moved into Ni’lin village, west of Ramallah. They raided and searched a house belonging to Mohammed Khalil Sorour (18) and then arrested him. At approximately 02:00, Israeli forces moved into Tubas. They raided and searched a number of houses and then arrested Saif Mohammed Hamad Daraghmah (18), a student at Tubas Secondary School. Around the same time, Israeli forces accompanied with a number of military jeeps moved into Beit Awa village, southwest of Dura, southwest of Hebron. They raided and searched 2 houses belonging to Mahmoud Raed Masalmah (16) and Ahmed Khaled Abu al-Jamal (17) and then arrested them. At approximately 02:30, Israeli forces moved into al-Salam and al-Jalaah neighbourhoods in Hebron. They raided and searched a house belonging to Abdul Rahim ‘Omran al-Atrash (28) and then arrested him. At approximately 03:00, Israeli forces moved into Jenin. They raided and searched a number of houses and then arrested Sultan Bassam Hamdan (31). At approximately 09:00, Israeli forces stationed in military watchtowers along the eastern borders of Beit Hanoun village in the northern Gaza Strip opened fire at the border area adjacent to al-Ahmer area. As a result, farmers and a number of bird hunters and shepherds were forced to flee for fear of their lives, but neither casualties nor material damages were reported. Note: During the aforementioned day, Israeli forces conducted (3) incursions in the following areas and no arrests were reported: Sa’ir village and al-‘Aroub refugee camp in Hebron and Howarah village, south of Nablus. At approximately 01:35, Israeli forces moved into ‘Aqraba village, southwest of Nablus. They raided and searched a number of houses then arrested Huthaifah Jamal Khater (26). At approximately 03:00, Israeli forces accompanied with several military jeeps and a truck with a crane moved into the southern area in Hebron. They raided and searched a workshop belonging to Tayseer Abu Sbaih (55) and then confiscated the workshop contents. The Israeli authorities claimed that the workshop is used for manufacturing ammunition explosives. The Israeli forces later withdrew, but no arrests were reported. At approximately 23:45, Israeli gunboats stationed offshore, northwest of Beit Lahia village in the northern Gaza Strip, opened fire at Palestinian fishing boats sailing within 3 nautical miles and chased them. As a result, the fishermen were forced to flee for fear of their lives, but neither casualties nor material damages were reported. Note: During the aforementioned day, Israeli forces conducted (3) incursions in the following areas and no arrests were reported: Jabaa’ village, south of Jenin, Bani Na’im village, and al-Fawar refugee camp in Hebron. At approximately 10:00, on Friday, 24 March 2017, dozens of Palestinian civilians organized a demonstration in al-Qabboun area near al-Moghir village, northeast of Ramallah, in protest against a sheep barn built by a settler in an attempt to establish a settlement outpost on the Palestinian lands. The Israeli forces immediately fired live bullets, rubber-coated metal bullets, tear gas canisters and sound bombs at the protestors. As a result, 5 civilians sustained wounds. The first civilian (29) sustained a live bullet wound to the lower limbs, the second (23) was hit with a live bullet to the lower limbs, the third (19) was hit with a tear gas canister to the head, the fourth one (19) was hit with a bullet to the thigh and the fifth (31) was hit with a tear gas canister to the head. 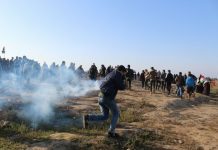 Following the Friday prayer, dozens of Palestinian civilians and Israeli and international human rights defenders organized demonstrations in Bil’in and Nil’in villages, west of Ramallah and in Kafer Qadoum village, northeast of Qalqiliyah, protesting against the annexation wall and settlement activities. Israeli forces forcibly dispersed the protests, firing live and metal bullets, tear gas canisters and sound bombs. They also chased the protesters into olive fields and between houses. As a result, many of the protesters suffered tear gas inhalation while others sustained bruises due to being beaten up by the Israeli soldiers. On Monday, 20 March 2017, the Israeli authorities allowed the exportation of 9 truckloads of tomatoes; 4 truckloads of cucumbers; a truckload of eggplants; a truckload of hot pepper; 1.4 tons of bill pepper; 11.5 tons of squash and 2.5 tons of cauliflower. On Tuesday, 21 March 2017, the Israeli authorities allowed the exportation of 20 tons of lemon. On Wednesday, 22 March 2017, the Israeli authorities allowed the exportation of 10 truckloads of tomatoes; 7 truckloads of cucumbers; a truckload of eggplants; a truckload of pepper; 0.9 tons of bill pepper; 14.08 tons of squash; a truckload of cabbages; 2 tons of cauliflowers; 4 tons of clothes; 0.09 tons of mint and 0.45 tons of garlic. On Thursday, 23 March 2017, the Israeli authorities allowed the exportation of 8 truckloads of tomatoes; 6 truckloads of cucumbers; 3.2 tons of eggplants; a truckload of pepper; 2 tons of bill peppers; 7a truckload of squash; and 0.5 tons of cabbages. On Sunday, 26 March 2017, Israeli authorities allowed the exportation of a truckload of lemon; truckload of fish and 15 truckloads of vegetables. On Monday, 27 March 2017, the Israeli authorities allowed the exportation of 38 tons of aluminum scrap and 9 truckloads of vegetables. On Thursday, 23 March 2017, Israeli forces established 3 checkpoints at the eastern entrance to Dura village and at the entrances to Samou’a and Raboud villages. On Friday, 24 March 2017, Israeli forces established 3 checkpoints at the entrances to al-Fawar and al-‘Aroub refugee camps and at the entrance to al-Ramadeen village. On Saturday, 25 March 2017, Israeli forces established 2checkpoints at the entrances to Kharras and Sa’ir villages. On Sunday, 26 March 2017, Israeli forces established 2 checkpoints at the entrances to Sa’ir and Beit Ummer villages. On Monday, Israeli forces established 2 checkpoints at the entrance to Raboud village and at the northern entrance to Halhoul village. On Tuesday, 28 March 2017, Israeli forces established 4 checkpoints at the entrances to Ethna, al-Shayyoukh and Samou’a village and at the western entrance to Hebron. On Thursday, 23 March 2017, Israeli forces established 2 checkpoints at the entrance to al-Nabi Saleh village, northwest of Ramallah and in ‘Atara village’s bridge, north of the city. On Saturday, 25 March 2017, Israeli forces established 6 checkpoints in ‘Atara village’s bridge, north of the city; at al-Taiba villge’s intersection (al-Mo’arajat raod between Ramallah and Jericho); at the entrances to al-Nabi Saleh , Deir Abu Mish’al and ‘Aboud villages, northwest of the city; and between Selwad and ‘Ain Yabroud villages, northeast of the city. On Sunday, 26 March 2017, Israeli forces established 6 checkpoints in ‘Atara village’s bridge, north of the city; at the entrances to al-Nabi Saleh , Deir Abu Mish’al and ‘Aboud villages, northwest of the city; at the intersections of Selwad, Deir Jareer and al-Tiba villges, northeast of Ramallah. On Monday, 27 March 2017, a similar checkpoint was established at the entrance to ‘Aboud village, west of Ramllah. On Tuesday, 28 March 2017, Israeli forces established 2 checkpoints at the entrance to ‘Aboud village, northwest of the city and in ‘Ain Yabroud village, northeast of the city. On Thursday, 23 March 2017, Israeli forces established 3 checkpoints at the entrance to Kafur al-Deek village, west of Salfit; between Kafur al-Deek and Burqeen villages, west of the city; and at the eastern entrance to Yasouf villge, east of the city. At approximately 16:50 on Friday, 24 March 2017, Israeli forces established a checkpoint at the eastern entrance to Qalqilyia. At approximately 23:00 on Saturday, 25 March 2017, a similar checkpoint was established near al-Fondouq village on the main street between Nablus and Qalqilyia. On Thursday, 23 March 2017, Israeli forces closed the entrances to western countryside of Bethlehem, which include Hosan, Nahleen and Wad Fokeen villages. As a result, civilians were denied access to their houses and work. Eyewitness stated that the Israeli forces closed with sand and cement barriers in addition to rocks the entrances leading to the western countryside villages , so vehicles and buses were denied access to the villages while the villages’ residents were forced to access the villages on foot. It should be noted that the checkpoints are established until now. At approximately 10:30 on Saturday, 25 March 2017, Israeli forces established a checkpoint at the western entrance to ‘Aqraba village, southeast of Nablus. The Israeli forces stopped Palestinian vehicles and checked their IDs. No arrests were reported. At approximately 14:00 on Thursday, 23 March 2017, Israeli forces stationed at the entrance to Beit ‘Aynoun village, east of Hebron, arrested Mohamed ‘Emad Jaradat (17), from Sa’ir village, while passing through the checkpoint. Mohamed was then taken to a police station in “Gush Etzion” settlement, south of Bethlehem. It should be noted that in the morning, the Israeli authorities closed the abovementioned entrance with an iron gate. They also forced civilians to pass through a bumpy road in order to reach their houses. The Israeli forces claimed that the closure came as a result of throwing stones at the Israeli vehicles. At approximately 16:30 on Friday, 24 March 2017, Israeli forces established a checkpoint on ‘Atara village’s bridge at the northern entrance to Birzeit, north of Ramallah. The Israeli forces searched Palestinian vehicles and checked their IDs. During this, they arrested Ahmed Hasan al-Barghothi (23), from ‘Aboud village, northwest of the city. At approximately 16:30 on Saturday, 25 March 2017, Israeli forces established a checkpoint at the intersection of Eastern Mazra’ah village, northeast of Ramallah. The Israeli forces searched Palestinian vehicles and checked their IDs. During this, they arrested Ahmed Saleh Suliman Ghawanmah (26), from Kafur Malek village, northeast of the city. At approximately 12:20 on Sunday, 26 March 2017, Israeli forces established a checkpoint at the entrance to Emateen village, northeast of Qalqiliya. The Israeli forces searched Palestinian vehicles and checked their IDs. During this, they arrested Ayoub Ma’zouz Sowan (20). At approximately 18:30 on Monday, 27 March 2017, Israeli forces stationed at Za’atara checkpoint, southeast of Nablus, arrested Ameer Khalid Sweilem (21), from Balata refugee camp, east of the city. Eyewitnesses said that the Israeli forces stopped a vehicle carrying Sweilem, checked the passengers’ IDs and then arrested him. At approximately 17:00 on Tuesday, 28 March 2017, Israeli forces established a checkpoint near ‘Atara village’s bridge, north of Ramallah. The Israeli forces searched Palestinian vehicles and checked their During this, they arrested Hamza Foad Jameel Abu al-Haj (23), from Deir al-Sodan village, northwest of Ramallah. At approximately 18:30 on Wednesday, 29 March 2017, Israeli forces stationed at al-Hamrah checkpoint, southeast of Tubas village, arrested Mohamed Husain Yousef ‘Ayidah (25), from Tubas. Eyewitnesses said that the Israeli forces stopped a vehicle carrying Mohamed, checked the passengers’ IDs and then arrested him. In a new crime of wilful killing, on Wednesday, 29 March 2016, Israeli forces shot dead Siham Ratib Nimer (49) at Damascus “al-‘Amoud” Gate in occupied Jerusalem. According to eyewitnesses, Siham was on her way along with her two daughters, Zahra (20) and Manar ( 22), to Jerusalem’s Old City through al-‘Amoud Gate. As they were walking, a verbal altercation happened between the Israeli soldiers and Siham’s daughters. When Siham attempted to intervene, an Israeli soldier opened fire at her. As a result, Siham was hit with live bullets to the chest and limbs and died. Eyewitnesses added that the Israeli forces moved into the area, completely surrounded it, and denied access to it. A paramedic, who was passing by the area and wearing his uniform, tried to offer first aid to her, but the Israeli forces prevented him. Furthermore, the Israeli Intelligence Service arrested Siham’s two daughters and summoned her husband Talal Nimer for interrogation. The Israeli forces claimed that Siham attempted to carry out a stabbing attack against the Israeli soldiers. It should be noted that, the victim was the mother of Mustafa Nimer, who was killed on 05/9/2016, when the Israeli forces opened fire at a vehicle traveling by Mustafa and his relative on ‘Anata Street in Shu’fat refugee camp, northeast of Jerusalem. As a result, Mustafa was killed while his relative was wounded. On Thursday, 23 March 2017, Israeli officers attacked Palestinian civilians in Jerusalem. Those civilians were identified as Mazen Ra’fat Showeiki (50) and Ahmed al-Taweel (26). Al-Showeiki said to PCHR’s fieldworker that he headed to his truck, which was in the Ministry of Interior parking, in Wad al-Jouz neighborhood, but was surprised with an Israeli officer coming, pulling him out of the truck and insulting him. The Israeli officer said to him, “Why did you hit my car parked there?” Mazen told him that he will repair the car and give him all the necessary papers. In spite of this, the Israeli officer hit Mazen at his chest and head. Mazen said that he hit the officer’s car on Tuesday, 31 March 2017, in the Ministry of Interior parking and on that day he could not know the car’s owner, so he left the area after waiting for over half an hour. Mazen added that a group of Palestinian young men attempted to prevent the attack, but they were exposed to beating as well. Furthermore, Ahmed al-Taweel said that a group of Palestinian young men attempted to prevent the attack, but were beaten and threatened with the officer’s firearm. The officer also said that three officer of the Israeli special forces along with guards, who work in the Ministry of Interior, severely beat the abovementioned Palestinian young men as shown in a video. As a result, al-Showeiki suffered from dyspnea and sustained bruises wounds, while al-Taweel suffered bruises in his eyes. On Friday, 24 March 2016, Israeli forces raided and searched a house belonging to the activist, Mohamed Shalabi (35), in occupied Jerusalem’s Old City, and then arrested him. In dawn, Israeli forces raided and searched houses belonging to ‘Alaa al-Deen al- Natsha (22), Mohamed Abu Shosha (21) and Hamza Milhes (21). All of the abovementioned persons were arrested. Following the Friday’s prayer, dozens of Palestinian young men organized a protest in al-Aqsa Mosque yards demanding for the killed victims’ bodies under the Israeli custody. When the protesters got out of the al-Aqsa Mosque, the Israeli forces arrested 3 children and then took them to detention centres for interrogation. The arrested children were identified as ‘Isaa Mohamed al-Ja’bari (17), Yazan Hisham al-Ja’bari (16) amd Siraj al-Deen Mireesh (14). On Saturday, 25 March 2017, Israeli forces moved into al-Sawanah neighbourhood in occupied Jerusalem. They raided and searched a house belonging to Ameer Waleed al-Bilbasi and arrested him. On Saturday, Israeli forces moved into al-‘Amoud neighbourhood in occupied Jerusalem. They raided and searched a house belonging to ‘Abed al-Raheem Barbar and arrested him. On Monday, 27 March 2017, Israeli forces arrested 4 of al-Aqsa Mosque guards while confronting an Israeli archaeologist, who attempted to steal one of the mosque stones. The Islamic Endowments (Awqaf) Department stated that an Israeli archaeologist attempted to steal one of the mosque stones, but the guards confronted him. In addition, when the archaeologist got out of the mosque, he attempted to raid Al-Marwani Mosque, but the guards confronted him as well. In the meantime, the Israeli forces arrested Loai Abu al-Sa’ad and Salman Abu Mayalah. Moreover they arrested two guards, Hamza Nimer and ‘Arafat Najeeb. In the evening, ‘Ahed Jouda and Mohanad Idrees, al-Aqsa Mosque guards, turned themselves in to al-Silsilah Gate police station for interrogation. Furthermore, the Israeli forces arrested 4 other al-Aqsa Mosque guards after raiding their houses in the Old City’s neighbourhoods and al-Sawana neighbourhood. The arrested guards were identified as Samer al-Qabani, Qasem Kamal, Osama Siyam and Khalil al-Tarhouni. 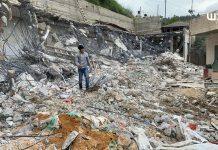 On Saturday, 25 March 2017, a Palestinian civilian, Yousef Bakhtan, self-demolished his house roof in al-Ashqariyah neighbourhood in Beit Haninah neighbourhood, north of occupied Jerusalem to avoid the Israeli Municipality’s high demolition costs. Yousef said that he demolished his under-construction house roof to avoid the demolition costs. The Israeli Municipality gave Yoused until 29 March 2017, to self-demolish his house roof, which was built on an area of 60 square meters, under the pretext of non-licensing. On Tuesday, 28 March 2017, Israeli forces accompanied with the Israeli Municipality crews and a bulldozer moved into al-‘Issawiyia village, northeast of occupied Jerusalem. The bulldozer demolished an under-construction house belonging to Ahmed Abu al-Humus under the pretext of non-licensing. The house was comprised of one floor and built on an area of 150 square meters. In the meanwhile, the Israeli forces headed to an under-construction residential building belonging to Muheisin family and then demolished the first floor built a year ago. The family stopped the house construction due to the Israeli Municipality decision. It should be noted that the family attempted to get a license, but the house was demolished without a prior warning. At approximately 09:00 on Monday, 27 March 2017, Israeli forces accompanied with Civil Administration crews and military bulldozers moved into al-Jeftalik village, north of Jericho. They demolished a barrack built of tin plates on an area of 144 square meters under the pretext of non-licensing. The barrack belongs to Anwar Mohamed Mahmoud Abu Jouda, whose family is comprised of 10 members, including 8 children. At approximately 12:30 on Tuesday, 28 March 2017, Israeli forces moved into al-Humma area in the northern Jordan Valley, east of Tubas. They confiscated a mobile house (caravan) belonging to Mahmoud ‘Awwad Ayoub. After that, they dismantled and moved it by a truck with a crane to an unknown destination. It should be noted that the caravan was donated by the ACTED Foundation.